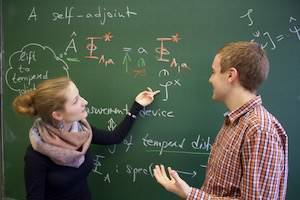 The regular physics degree courses at the Friedrich-Alexander-Universität Erlangen-Nürnberg (FAU) and University of Regensburg provide excellent and broad education for physics students who aim for a great variety of ambitious and successful careers in industry, teaching and academia. However, some students decide, early on, to pursue a career in academic research. They seek suitably tailored courses and additional training in demanding research projects as well as summer and winter schools. The Elite Graduate Programme in Physics – a unique course of studies funded directly by the Bavarian state government and this university – offers precisely this: exclusive research-focused courses embedded into the standard physics programme at Erlangen and Regensburg which are complemented by an extensive programme of research schools and social activities. Entry into the programme – from within this university or from other universities worldwide – regularly takes place at the beginning or during the second year of undergraduate studies. Admission is contingent upon very strong academic performance during the first year of university studies, which needs to be demonstrated on paper and in an interview with a panel of university professors. An open mind and a well rounded personality are further requirements for admission.